Vancouver - green flag, orange hexagon bordered white, charged with a white bird. Montréal - white tapering swallowtail bordered green; red maple leaf, charged with white "S"
The company was located in Quebec. It was a very light grey pennant, cotized black green at two of three edges. Shifted to the hoist was a green initial “S”. Vancouver BC - white flag, in center red block, white "S". This entity has a symbol of its own briefly shown on the Algoma website's introduction (under 'Performance'). The symbol unites the Upper Lakes and Algoma logo's. What appears to be a flag is really that, see Boarnerd. Seaway Marine Transport is a partnership of Algoma Central Corporation and Upper Lakes Group, Inc. (...) Seaway Marine Transport represents a merger of two prior partnerships of Algoma Central Corporation and Upper Lakes Group Inc. called Seaway Self Unloaders and Seaway Bulk Carriers. These partnerships have been in existence since 1990, in the case of Seaway Bulk Carriers and 1994, in the case of Seaway Self Unloaders. The merger of the two partnerships and the creation of Seaway Marine Transport was effective January 2, 2000. Only the name ‘Seaway’ appears on the flag. As Jan has reported this is an actual flag with the flag containing the funnels of the two companies involved except that the Algoma one has not got any lettering on the red ring surrounding the bear. Going by a clearer photo I have of the flag being flown by the "Algosteel" and the image shown in the Know Your Ships series, the outer funnel edges are vertical being the flag edges but the inner edges are sloped, producing a white triangle descendent from the chief, until down the bottom the black of Algoma overlaps the red of ULS with the white lettering "Seaway" placed in base on the overlapping area. 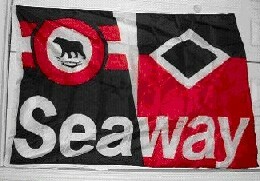 Apparently this flag was previously used by the earlier partnership of Seaway Self Unloaders, whilst the Seaway Bulk Carriers used a slightly different version with the lettering being "SBC" [see ca~s1310a.gif attached] being sourced from the Know Your Ships series. All three partnerships appear to have been involved as mangers only of most of the general lakers of the fleets of the two companies involved , with the flags being flown in addition to the owners normal house flags. The company was located in Toronto. The flag was divided by a wavy, horizontal line into white over blue. In the middle of the white stripe is a blue trident. The blue stripe is divided by two white barrulets wavy. Another of the – once very numerous – Great Lakes shipping companies was the Soo River Company which existed 1975-1982. Also known as Pierson Steamships (in fact controlled by Robert Pierson Holdings Ltd), Soo River started out by buying old ships – bulk carriers – from different firms, transporting for instance grain and cement. The firm took a dynamic start but in 1982 all nine ships were placed in receivership and bought by P&H (Parrish & Heimbecker) Shipping of Mississauga, Ontario. The house flag is a swallowtail with a broad black stripe near the hoist and the rest of the field white, within a narrow black border (leaving a small stripe of white between it and the broad black stripe); in the centre of the white field is a black shamrock. Flag based on the Mystic Seaport museum Lloyds Book of Flags and Funnels search page: http://library.mysticseaport.org/initiative/ImPage.cfm?BibID=11061&ChapterId=8 (p. 21). Location: Saint John, New Brunswick. From Boatnerd, a Toronto based concern, third row, third picture. Red swallowtail bearing a small black diamond, edged white. The vertical axis of this diamond seems to be situated at 1/3 of flag’s length. It is also shown in action. We own a fleet of dry bulk cargo vessels that sail on the Great Lakes and St. Lawrence Seaway System. Our vessels are capable of handling a vast array of dry bulk commodities and are managed by SMT Services, our partnership with Algoma Central Corporation. We also operate an articulated tug-barge unit that is especially constructed to carry liquid asphalt and other petroleum products. (…) We own a group of companies that provide various services from shiprepair and shipbuilding to fuel bunkering and industrial repair acitivities outside of marine industry. (…) Upper Lakes Group Inc. was started in 1932 with the purchase of an old freighter, which was used to move grain from Thunder Bay, Ontario to Toronto, Ontario. Today, Upper Lakes Group (ULG) own eighteen vessels which move grain throughout the Great Lakes and St. Lawrence Seaway. Flag horizontally divided red-white with a big V counterchanged white-red in the middle. In 1995 they relocated to Canada (from Hong Kong) and changed name to Valles Steamship (Canada) Inc. This new firm is an affiliate of McKeil Marine, its company seat being Ridgeville, Ontario. Currently it operates one ship - a rather old one at that - bought from another firm, and is readying another one for the spring of next year. The company website features an ‘M’ initial as the logo. Apparently it is white with small vertical blue borders and the italic ‘M’ initial in the centre, also in blue. Still expanding – having acquired its third ship now – the company specializes in bulk transportation, mainly agricultural. Tentatively described at first, the house flag is now seen as being bright blue with a Canadian pale (white) bearing a stylized cursive initial ‘M’ in the centre. This blue initial I realize now is shaped in such a fashion that the centre part is also readable as a ‘V’ and discreetly shadowed. This is the flag of Imperial Oil Ltd. which originated 1880 and still operates as a subsidiary of Esso Petroleum Canada as part of Exxon Corporation. A similar flag with white letters "I.O.S." and blue letters "CO. LTD" with the initial letters of the last group being taller, was used by Imperial Oil Shipping Co. Ltd. which was incorporated back into Imperial Oil Ltd. in the late 1950s"as the Marine Division. A white swallowtail bearing a red St George’s cross and a green maple leaf in the upper hoist. Site's source: (quote) Brown's Flags and Funnels by Philip Wedge. (...) merely concerned the funnel. The maple leaf on the bowl is less elaborate than this one which rather resembles that on the current national flag.